Skin is a texture image that replaces the default skin of your avatar. 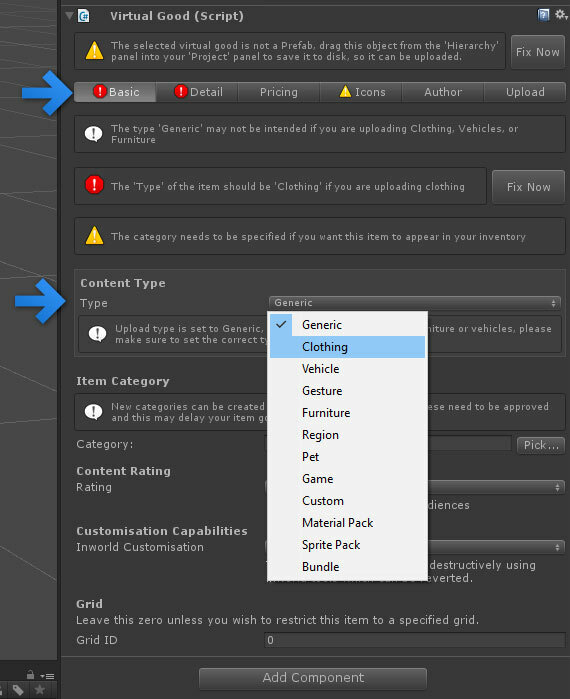 Skins can be re-made and uploaded in Sine Space using the Virtual Goods component. You can download the default avatar skin template from the following link. Sinespace avatar Skin: | Download. Once you have created the Skin save the PSD and import it back to Unity. 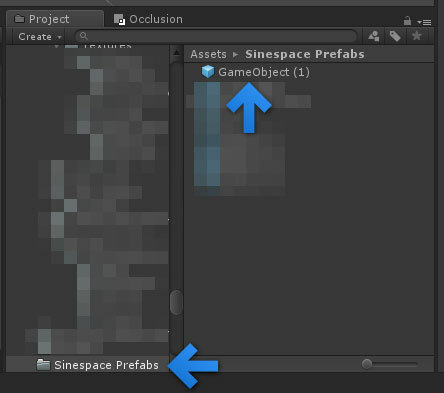 Unity uses a working folder called the "Assets Folder" - anything in this folder is accessible in Unity in the 'Project' panel. You can right-click in the 'Project' panel, and select 'Show in Explorer' (or 'Show in Finder' on MacOS) and view the files. To import the texture into Unity, simply save it into this folder. 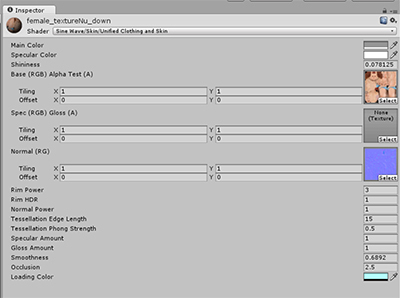 Unity will detect and import the texture when you tab back into it. 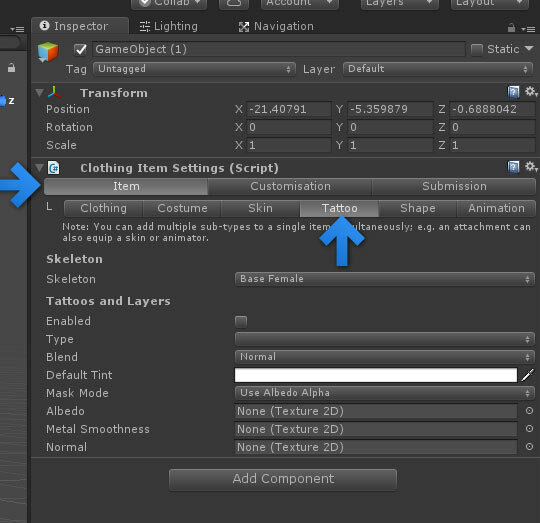 A skin is a special type of Clothing Item - as of Editor Pack 12, we strongly recommend uploading skins using the new 'Tattoo System' which is documented below. The next step is to format it as a item - fill in details on the name, pricing, etc. You will then need to adjust some settings - fill in the form until all the red exclamation marks have vanished. 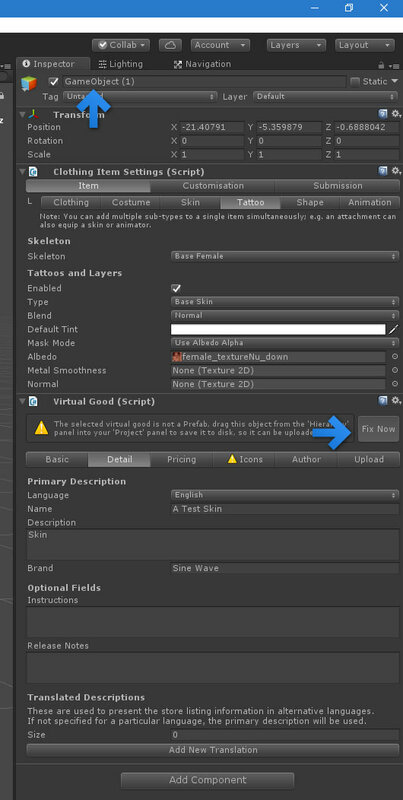 Finally, to save this to disk (so that it is stored as a file, versus simply an object in your scene), click the 'Fix Now' button to convert it to a prefab; be aware the objects name (at the top) will be used in the filename, so you may want to rename the object prior to clicking this button. You may now upload the item from the Upload tab, this will upload it to the world directly. 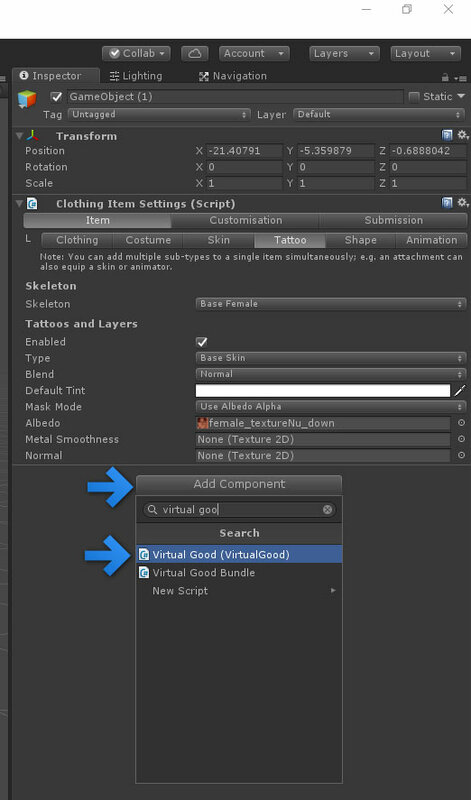 Hit the 'Play' button in Unity, and the avatar should preview, while wearing the item. 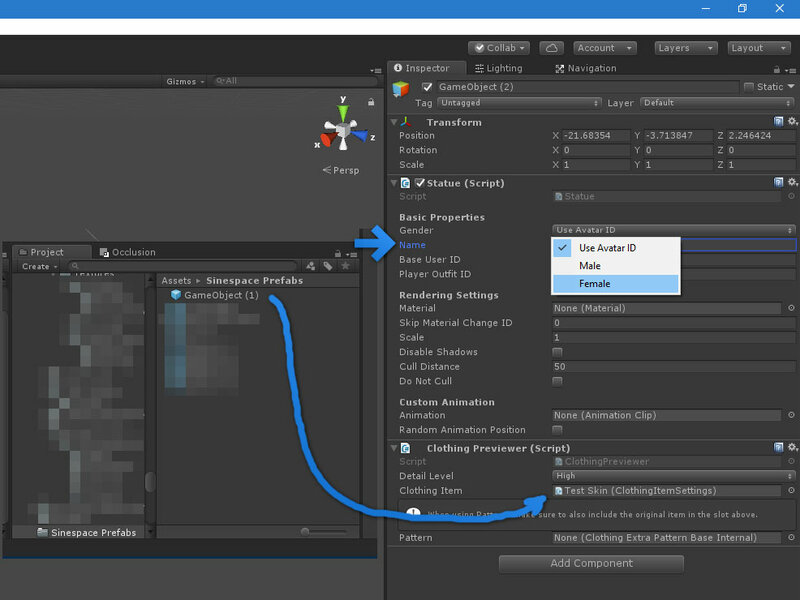 If you need to use a custom shader or material for your skin, follow this procedure. Note this method may not be as compatible with tattoos and makeup layers. 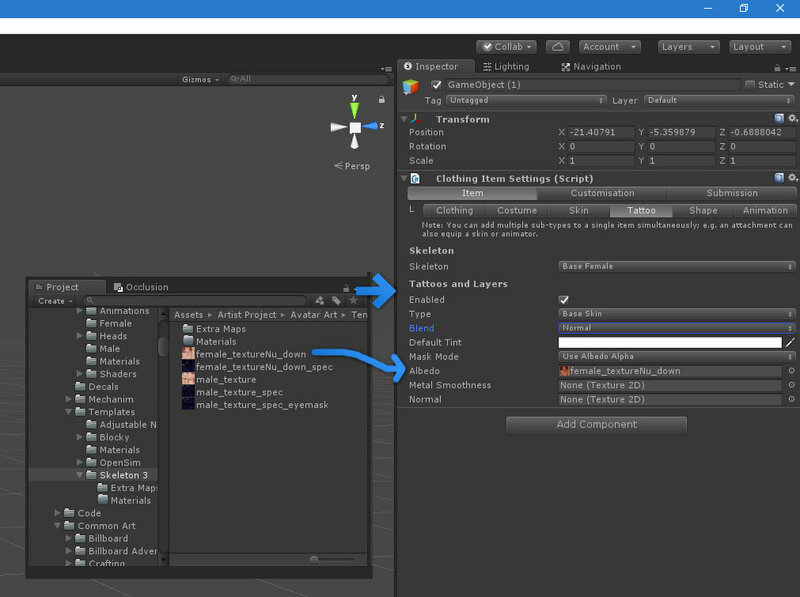 you can create a new material and drag skin texture and normal map in normal map slot. Once the material is created you can chose the material shader for skin from built in unity standard, custom shader or SineWave skin shader. Once the skin material is created, it needs to be converted to fit the skeleton. 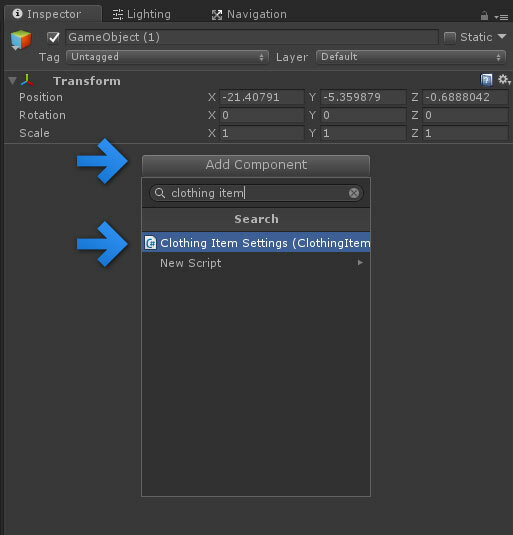 Create an empty game object in the scene and add the Clothing Item Settings Component to it. 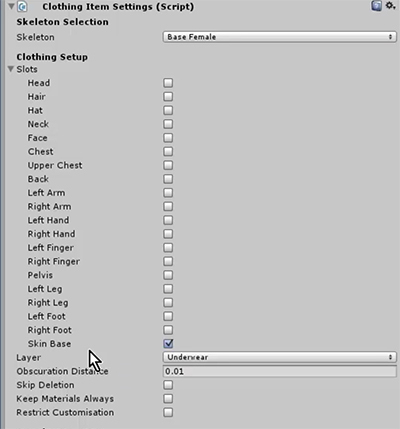 Chose the relevant Skelton for the clothing item. Please note Space supports multiple third party skeletons as well as it's own native male and female models. If you are creating only skin, select Skin Base slot. If you want the skin to have more than just skin select other applicable slots. Select Only contains skin if you are uploading skin only. If you are doing a combined outfit Don't select this. 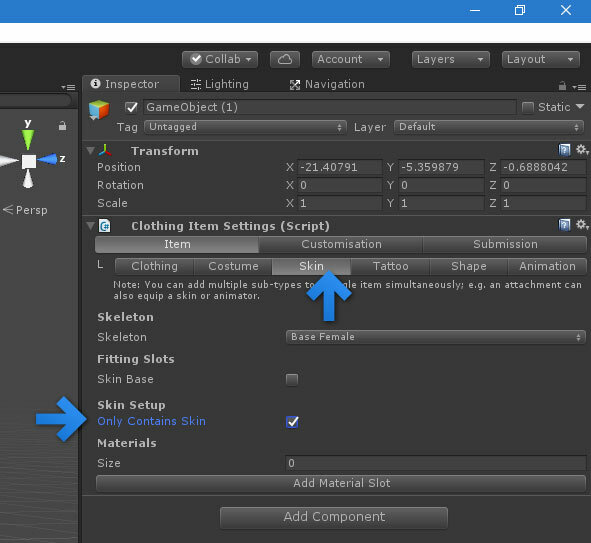 Note : if you are not making just skin you will have to click on Convert to skinned button later. if you are creating just skin this step is not needed and the button will disappear as soon as you select Skin only. Set the number of material the skeleton you are using has. Sine Space male and female skin only has 1 material; if you have selected that as the skeleton Set the size to 1. After the size is set. Drag the skin material in the material slot.